” Spending time in Fiji will be my first ‘real’ vacation since I started law school two years ago; shocking since I used to travel outside the U.S. twice a year before I started law school. It’s still hard for me to believe that my law school journey will be complete in December, I suppose now is an ideal time to reflect on how far I have come and prepare myself for the exciting adventures that are yet to come!” – Law school is life changing, and so is living and studying in another country. Here’s a snippet from WMU-Cooley Study Abroad student Joey Trowbridge’s Blog! Keep up with her adventures and legal studies in Australia on her Legally Abroad Blog page. Checked into the Hilton Denarau Island Resort and was pleasantly surprised when they upgraded me to Diamond status for this stay. Oceanfront 1-bedroom condo, free breakfast and dinner, I’ll take that! Enjoyed a real Fijian breakfast; the waitstaff sang local folklore-like songs to the guests in the dining room, it was spectacular. Afterwards I relaxed by the pool, read and soaked up the sun and incredible sea breezes. This afternoon I took a boat over to Mana Island for snorkeling, shelling and a bit more relaxation. I snorkeled around a coral reef, spent some time in the salt water pool and just relaxed. The Mana Resort was amazing as well. The tour guide mentioned that they will be filming a movie on the island very soon. They have carpenters onsite building the sets already – the entire island will be closed to the public for six months. They were interviewing the crew for the film while I was there; I probably should have applied – I could get used to living here! Anyway, while having lunch, a guide asked if he could join me. We chatted about how he had lived in the U.S. for a few years when he played rugby on a sports and entertainment visa. Since I am seriously considering immigration, this was all very interesting to me. I spoke about my desire to get out of the U.S. and he spoke of his desire to go back to the U.S. While I don’t have a plan right now to make my dream happen, he has a well thought out plan to make his happen. I will be praying for him as he has an appointment with the U.S. Embassy next week in order to get a visa. He has inspired me to work on my plan. What struck me about these islands is how friendly all of the people are and they seem genuine; there are a lot of smiles and laughing; you cannot walk by another without being greeted with “Bula,” Fijian hello. I suppose waking up everyday feeling the sun on your skin and taking in this spectacular beauty would put a smile on my face too; this is a place I can see myself living long term – time to start working on my plan! Having traveled throughout the Caribbean extensively, Fiji really is superior in every way. It is a land of cultural engagement, seen in the Powhiri, a traditional custom that defines important meetings by explaining a group’s ancestry and why they wish to meet, and in the Hongi, where foreheads and noses press to share the breath of life. Kiwi English offers its own delights. You can be keen to have a yarn with your mates about how bad the mozzies are while sharing some lovely lollies, biscuits, and confectionary. You can have a glass of bubbles and a handful of nibbles before having a proper tea in the evening. You can choose whether to wear togs and jandles, track pants and trainers, or look brilliant in smart casual attire. If you get yourself sorted, you might head to the grocery and load up the trundler, making sure to buy some hokey-pokey, then take the lift to your flat. If you’ve had a tough day, you might have a grizzle with a mate, but then realize everything is spot on, and end the day with “No worries!” Most of us are looking forward to Melbourne, but a piece of our hearts will remain in Aotearoa, New Zealand. WMU-Cooley, as a Military friendly and designated Yellow Ribbon School, talks to its military students, faculty and graduates about their journey from the military to law school and about their career goals. This month we feature WMU-Cooley law student John Pickens who is a former Staff Sergeant with the United States Air Force. Why did you decide to go to law school and why did you choose WMU-Cooley: I have wanted to make a difference by helping everyday people from day one. I chose WMU-Cooley Tampa Bay over Barry School of Law and Florida A&M due its practical legal skills approach as opposed to legal theory or academia approaches. Although accepted to all three law schools, location and practical legal skills were my primary concerns and most important in my law school decision. My desire to learn the law was inspired during my service in Air Force Security Forces. Completing an honorable six-year enlistment with the Air Force provided the foundation and discipline I would need for law school. As a man of faith, I have always believed there is no higher profession than public service. I firmly believe that, in the end, it’s how I served during my life matters and not how much wealth I have accumulated. Since higher education was highly valued and continually emphasized throughout my childhood, I faced a new challenge and question after serving in the military – how could these core beliefs coexist? There is a scripture that goes “He will make our crooked paths straight.” With that, the answer to my dilemma would soon become clear. For years, I have had hidden interests in the courts, politics, sciences and our socio-economic beginnings as a whole. All of these entities are touched and woven into our nation’s fabric of law. I soon would recognize that a legal education could be used to effectuate much change in my community and nation, just as did my military service. Continuing my education with the end goal of public service would be realized and pursed at WMU-Cooley Law School. Career Description: As an Air Force Security Forces member, your mission is to protect all personnel and property assigned. During my six years of active duty service spanning from 2002-2008, I conducted law enforcement, installation security, air base defense and detainee operations. In support of missions both overseas and stateside, I secured aircraft, satellite and nuclear weapon systems valued at millions of dollars. As Staff Sergeant, I was also responsible for providing supervison of newer security forces, airmen securing protection level resources and government property. In Security Forces, I trained and qualified in various weapons systems, including the M-9 beretta, M-4 carbine rifle and M-249. I was stationed to a variety of Air Force Bases including Kirtland New Mexico, Thule Greenland, MacDill Tampa, with a deployment to Bagram Afghanistan. Now a full-time law student student and veteran, I often reflect on my military service and experience. It was truly an honor to serve. All of my assignments have been challenging yet rewarding as they shaped who I am today. Career goals: There are a multitude of career opportunities a law degree from WMU-Cooley grants, but commissioning as an Air Force JAG is my top goal. Serving in Air Force Security Forces gave me the opportunity to serve my fellow airman and represent the nation. As an Air Force JAG, I will continue to serve, only this time as a legal advocate. During my second year of law school, I applied for and was offered an externship opportunity with the 6th Air Force Judge Advocate unit on MacDill Air Force Base. I cannot say enough great things about the entire staff at WMU-Cooley and the Air Force. They both worked in a collaborative fashion to assist me throughout the entire externship process. The externship experience has been a great blessing and honor. I could not have asked for a better law school and would advise anyone considering WMU-Cooley to look no further. Tell us a little about you: Graduating from law school and performing great service in the community and nation with my legal education remains my number one goal. As for a little about myself, I was born in Boynton Beach, Florida. I am one of three siblings; two older sisters and a younger brother. Our family believes in keeping God first, so staying involved with faith-based activities is extremely important to me. My other personal passions include; hiking nature trails, playing the drums, reading, kickboxing and staying up-to-date with political issues of the day. I look forward to having a family of my own one day, but remain grateful for where I am, what I have, and where I am going. 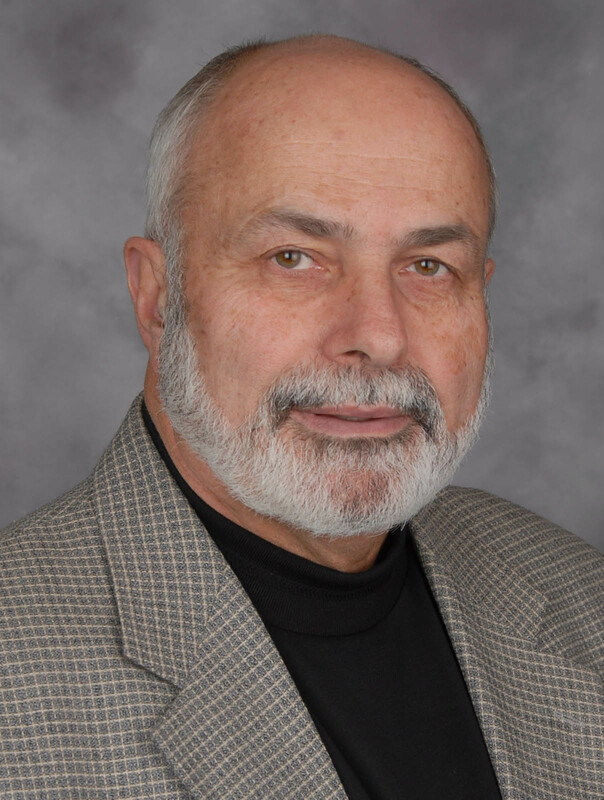 Professor Gary Bauer has been a member of the full-time faculty at WMU-Cooley Law School since 1998. He now teaches Estate Planning to third-year law students and a directed study class he created called Solo By Design. Professor Bauer’s blog, found at sololawyerbydesign.com, provides law students, recent solo practitioners, and seasoned professionals who wish to go solo, with information and resources to be successful in the legal business. This blog was originally published in January 2015. What will I find off the end of the dock? “I am not afraid; I want to work for someone else to get experience before I go solo.” This is a common response. The truth is that your experience will be hard earned. It will not come easily when you are struggling to bill the minimum hours for your employer. Do you really think the experienced principals in your office will be sitting by your side teaching you how to practice law step by step? They are billing at $300 an hour and you are billing at $100 an hour. How much time do you think they will devote at the $100 rate tutoring you? while missing out on their own billables? They can’t double bill. The new reality, even in the large and well financed law firms, is that they are looking for “practice ready” lawyers to populate those firms. Sure, the real large firms will invest time and money in you – but are you graduating in the top of your class and do you think you will land the $160,000 first year job? If not, take a lesson from those who have been down a different road. This is the new norm – first day for the new associate after being escorted around the office to find the coffee-maker and restroom; “We have a hearing scheduled next week on a motion to dismiss. Here is the file, prepare a response.” So you ask the paralegal for assistance – “Sorry, I am too busy, and I have minimum billables to produce just like you.” You ask for assistance from another junior associate – “Sorry, I have enough trouble meeting my required billables, and besides, I don’t have any more experience than you. Go figure it out.” (To herself, “besides, I am competing against you why should I help you?”) So, you figure it out and do your best and present your work to your superior who proceeds to chew you out. He tells you that, “we got deadlines to meet, get it done and done properly, do it over . . .” You soon find out that you will learn a great deal by osmosis and observing about the culture of the firm. But the substantive law, for the most part, will be gleaned from the practice manuals and research that you do on your own. And once you have a steady paycheck, you begin to acquire a car payment, a house payment, marry and have dependents who need medical insurance. Four years out when you have finally established yourself as a family law attorney with a good reputation and understanding of that area of practice, you are too far in debt to quit and go out on your own. So you look for someone on the outside to partner with you to help you restart and break free of the “rat race” so that you can have time with your family. Let’s hope that your new partner will feel the same work ethic as you and won’t be on the golf course on Friday afternoons when you are completing the brief that is on deadline. Here is another scenario which I want you to think about. Go solo right out of law school. Keep your overhead low and establish a business plan before you leave law school. I can help you do that in a way that will help you to succeed in the business end of this profession. You will also find out that there is help out there to get you acclimated to the practice principles and tools that you will need to be confident that your lack of experience will not hurt you at all. I call it Solo Lawyer By Design. It is a Blog for law students and recent grads who are going solo. This is a resource for materials, guidance and information from experts and lessons from those who failed so you know what not to do. It may surprise you, but in today’s law firms, you are a solo. If you can’t work independently and develop business contacts, you will not be retained. So if your feet will be held to that fire in a firm, why not fan a fire of your own? Go solo! But I really believe that you don’t fear failure – you fear success. As I heard Sarah Ostahowski, http://www.ski-law.com, a recent very successful graduate say, “It is your fear that if you are successful and bring in a lot of clients – what do you do with all of them?” And she was right. When a client asks a question and you don’t know the answer – what will you do? Follow my posts and the answer to that question will be made clear. 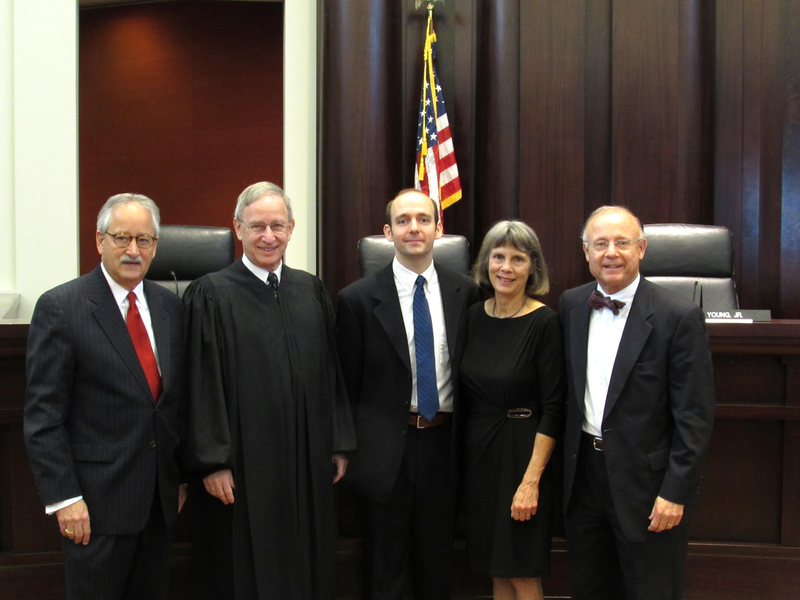 From left: State Bar of Michigan President-Elect Larry Nolan, Justice Stephen J. Markman, newly admitted Martin Fisher, and Martin’s parents, Julie and Professor Gerald Fisher. Law school graduation and passing the Bar Exam are milestones every law school graduate treasures. For one particular graduate of the WMU-Cooley Law School, the swearing-in ceremony also continues to resonate as a stand-out memory. Martin Fisher, son of WMU-Cooley Law School Professor Gerald Fisher was officially sworn into the Bar by none other than Michigan Supreme Court Justice Stephen Markman. It was “a swearing-in ceremony for a family to remember,” Professor Fisher characterized the November 16, 2015 prestigious event with his son, Martin Fisher. Martin Fisher is pursuing a career in elder care. 1. Now that the law school is holding elective courses on WMU’s Kalamazoo campus, where are the law classes? For now, Western Michigan University is sharing with the law school Room 1412 in its Health & Human Services (HHS) Building on WMU’s East Campus off Oakland Drive, behind (south of) the football stadium and sports complex on Stadium Drive. The HHS Building location makes sense in that the law school already has a dual JD/MSW degree program with the College of Health & Human Services’ School of Social Work. The HHS Building is a spectacular, first-class facility with wonderful natural-light design, a cafeteria, lots of relaxed seating, and convenient parking. Room 1412 is a team-based learning room with cart-available distance-education technology. 2. What is the medieval-looking bell-tower-like structure next to WMU’s HHS Building where the law school holds classes? The HHS Building is next door to the Kalamazoo Psychiatric Hospital. Its tower is not, as rumored, to restrain the insane, but for the better part of a century supplied the hospital’s water. At one point in the tower’s storied history, its water saved Kalamazoo from burning when the city’s own water system failed as firefighters attempted to douse a severe downtown fire. Although the water tower is a historic landmark, locals not too long ago made an effort to have it razed, relenting only when private funds donated for maintenance exceeded the six-figure cost of its razing. 3. What is the heart of WMU’s Kalamazoo campus? Where does everyone go? Bernhard Center, located roughly in the middle of WMU’s Main Campus, houses the bookstore, Bronco Mall, cafeteria and food court, financial-aid office and other student services, student-organization offices, and large conference spaces. While the building’s exterior is a little older, WMU has renovated many of its interior spaces, making it both very comfortable and also a showcase. 5. Where can you eat on campus? Lots of places. While the Bernhard Center has the well-developed food court with national fast-food chains, a Biggby coffee shop, traditional cafeteria, and lots of comfortable seating, several other buildings also have public cafeterias including the HHS Building housing the law classes, Schneider Hall housing the Haworth College of Business, and Sangren Hall housing WMU’s large College of Education. The Plaza Cafe, located on the Fine Arts Plaza in front of Miller Auditorium, is also open to the public. To locate food on campus–Go to the WMU Housing and Dining map to get the precise locations of the buildings with cafeterias. 6. Who are WMU’s most-distinguished alumni? Tim Allen, anyone? The popular film and television actor is on its Distinguished Alumni wall in the Bernhard Center (see the wall on the second floor for a great way to get to know WMU’s national leadership). WMU’s most-recent distinguished alumni awardee is former U.S. Attorney and WMU-Cooley adjunct James Brady, whom the law school honored recently with the Marion Hilligan Public Service Award. (The other 2015 awardee was the CEO of the world’s largest tire and wheel retailer.) Other lawyer/judge WMU distinguished alumni include former ABA President Dennis Archer, Sixth Circuit Judge Richard Griffin (son of Senator Robert Griffin), Richard Whitmer, former State Bar of Michigan President Nancy Diehl, and of course WMU-Cooley graduate and board member Ken Miller. Other distinguished alumni include former Detroit Tigers owner John Fetzer and former Tigers and Marlins and present Red Sox general manager Dave Dombrowski. 7. Tell me about the WMU library and its resources. With more that 4.5 million items, including thousands of electronic subscriptions, the libraries provide access to a wide variety of materials in support of its many educational programs. Over twenty reference librarians, many with subject specialties, are ready to assist students with their information and research needs. The library has recently initiated an experimental telepresence robot to aid in research interactions between students and librarians. Four floors of newly renovated state of the art facilities provide comfortable spaces for collaboration, research, and study. 8. What’s your favorite location on campus? Whether or not you have business there, consider visiting Sangren Hall in the center of WMU’s Main Campus. One of President Dunn’s many initiatives has been the improvement of WMU’s physical facilities. Sangren Hall, home to WMU’s oldest college–the College of Education–is the spectacular centerpiece of that initiative. It has every feature of a next-generation higher-education facility including state-of-the-art team-based-learning classrooms with distance-education technology and wide, spacious, and well-lit public areas with abundant comfortable seating and study areas, not to mention a great-looking library and convenient cafe. It even rivals the spectacular new WMed facility downtown (WMed built with substantial private and corporate contributions). WMU has constructed several other large, inviting, and very attractive facilities that make you feel very much a part of the latest and best in higher education. 9. For what does the public know WMU? What distinguishes it? WMU was initially a teacher’s college, and its College of Education remains its largest program. That history and emphasis may have influenced its mission and vision as a learner-centered university combining clinical education with research focus. Students matter, but so does research and expertise. Many of WMU’s Ph.D.-level faculty are recognized national and international experts in their fields with heavy demands for their expertise. WMU is also diverse, recruiting heavily from Southeast Michigan and other urban areas. It has had a global reach for decades, with faculty from around the globe and international students from 100 other nations. A Carnegie-designated national research university, WMU is in the U.S. News top tier of public research universities. Many also know WMU for programs as diverse as its nation-leading aviation program and its internationally recognized offerings in creative writing, medieval studies, behavior analysis, blindness and low vision studies, integrated supply chain management and jazz studies. WMU also has a decades-long reputation for a commitment to sustainability and environmental stewardship that won it the U.S. Building Council’s award in 2014 as the best green higher-education school in the country. 10. Okay, but how’s the football team doing? Great. WMU has a Division I (top division) football program competing with the best collegiate programs in the nation, including playing both MSU and Ohio State in 2015. WMU is in the Mid-American Conference (MAC) with in-state rivals Central Michigan University and Eastern Michigan University, and out-of-state schools like Toledo, Northern Illinois, and Bowling Green. While WMU has long been known more for its hockey team than for football success, WMU’s football teams have been to bowl games the past two years, winning the Bahamas Bowl just this year, and has had the MAC’s top-rated recruiting class the past three years. WMU’s football program is thus gaining national attention, as is its sought-after Coach P.J. Fleck. The program has a state-of-the-art indoor practice facility and a football hall-of-fame building, both adjacent to the stadium with a large indoor president’s box seating 100. Apologies to WMU-Cooley Board Chair Larry Nolan, a WMU hockey-program veteran, for not touting WMU’s outstanding hockey team, which is part of the toughest hockey league in the nation–the Central Collegiate Hockey Association. See WMU’s sports Hall of Fame for WMU’s long list of stellar college and professional athletes.